I know I have updated for ages and I'm sorry! I guess that's what happens when you get hooked on a new video game. Playstation has been monopolizing my time! Now that I have a few days off for Christmas, I really wanted to commit to a scrap session ad came up with this earth-toned layout. In this particular sketch, I wasn't worried about matching the color theme to the photo. The result is a little bizarre as the rusts and chartreuse tones are definitely not the expected colors for a pink and blue photo. I don't mind a little color clashing and it definitely makes my photo stand out. I starting with putting a black matte around my orange paper. Both this and the green damask print came from The Paper Studio's Tattered and Worn Stack. I added a few random strips from my leftover scraps stash to the bottom of my green paper. I embellished with buttons, tags, studs and die cuts from Kaiser Crafts' Scrap Yard collection. I also used stickers by Simple Stories and Me & My Big Ideas. This sketch was done for Color, Story, Inspiration's 244th case file. I like the non traditional take on red and green holiday colors. That's all for this time. Thanks for reading! It's been so long since I've updated. It feel good to be scrapping again. Today's page once again features my kitty Jupiter who is cute as she is scrappy. She is definitely one of those cats who will be purring one moment, and trying to bite the next. I love her to death but sometimes I think she's out to get me! I started with plain white card stock and raided my stash of paper scraps for patterns matching the chosen color palette. I paid those papers with the black and white heart print from The Paper Studio's Mint to be Fab stack and blue and gold polka dot paper by Echo Park Paper Company. This page was created for Color, Stories, Inspiration's October challenge. Hi scrappers! I bring you anther quick post with a page featuring my fluffy kitty Europa. This photo really captures her quirky personality and cuddly nature. It's so funny how expressive she can be times and how well she can communicate her moods. I started with basic white paper and matted it with a cool toned brown cardstock from The Paper Studio's Affinity Textured Cardstock stack. I then matted by photo on muted red cardstock and used a strip of earth toned patterned paper from The Paper Studio's Affinity stack. I added pale lavender paper as an interesting accent along with some other pastel embellishments to counteract the darker focus paper. The scalloped cloud sticker is from Mambi's Kid's Stuff collection. Wooden buttons from Shimelle's Go Now collection and cat themed die cuts from Roxie and Friends were also used. This page was done for only one challenge this time. Stuck?! Sketches had a wonderful layout for this July challenge and I really love how it works with my photo. I stayed fairly true to the original sketch, right down to the scalloped embellishment on the right, but I used a much larger photo and added some more tags. I love summer. I love the heat and the sunscreen and ice cream. Most of all, I love the beaches! These images were taken by my husband at Laguna Beach. I really like them because they are not the typical beach photos with swimsuits and sand. It was late in the day and I was wearing some weird leggings. The light was just right and my husband took some long exposures, resulting in some unique Summer photos. I started with perfect paper from Craft Smith's Summer Dream pad. Not only is this paperthe perfect color and matches the theme, it even has an appropriate title built right in! I then matted it on solid pink paper and added embellishments like lace, mini tags, star brads and paper scraps. The layout for this page comes from Stuck?! Sketches' July challenge. It really was the perfect sketch for the photos that I have and finding paper with a title corresponding to the size and placement in thee sketch was too perfect! Lastly, I participated in Scrap Our Stash's July tic-tac-toe challenge and chose the squares "red white and blue," "stars" and "tags." It was fun taking the 4th of July themed challenge and putting a spin on it. It's still Summery, but not at all a portrayal of a patritic holiday. That's all for now scrappers. Thanks for stopping by my page! Does anybody else save every little paper scrap, sticker or odds and ends no matter how weird in the event it will be perfect for a scrapbook page? I have a fantastic twenty drawer apothecary that I store everything from sequins to buttons to embroidery floss in so it is relatively organized. Some of this stuff I've had for years, maybe even a decade, but even the strangest stuff seems to find its way onto pages. That was the case for this page. The title quote by poet Ralph Waldo Emerson was a left over paper scrap that I had hung onto for ages and it finally found a home as the perfect title for a page full of flowers. Even the sticker featuring a nature quote (also by Emerson,) became the perfect journal block and was something I had stashed away a very long time ago. The theme and color palette for this page were inspired by this beautiful painting by Michael Sass. I incorporated the color scheme and of course lots of flowers. Doing so qualified my page for the May challenge over at ARTastic Challenge. The layout was taken from Stuck?! Sketches' May challenge. I followed the original sketch pretty closely this time except for changing where the title and journaling went. I even incorporated a doily, although I had room for only half. Lastly, I participated in a tic-tac-toe challenge at Scrap Our Stash. I used the left vertical column Journal Card, The Color Yellow and 3+ Patterned Papers. Sorry for being MIA lately. I was spending some time on my Etsy shop which is now finally open! When I'm not making scrapbook pages, I make homemade bath bombs without artificial additives. You can check out my shop here at The Bubble Company. This post features yet another photo of my lovely kitty Europa. She's a Turkish Angora mix that we found up for adoption at our local Petsmart. We have no idea what her life was like before we got her, but her life now pretty much consists of sleeping, eating, cuddling, and being exceptionally fluffy. I started with various colors of acrylic paints that were watered down to give a watercolor effect on my basic white background. A floral and wood grain print from My Mind's Eye's Bramble Rose collection made for the perfect accent. Amy Tangerine stickers by American Crafts was used for the title and Bo Bunny Brads made perfect accents for fabric flowers. Prima Marketing's paper flowers made for a nice understated embellishment. This page was done for the April challenge at Color, Stories, Inspiration. The inspiration photo practically begged for a cat themed layout and I loved the warm autumn color scheme. I kept my layout similar to the one provided except for switching around the squares to better accommodate the watercolor design I had made. That's all for now! Thanks for visiting my page! Sometimes I wish I had more diverse photos besides cats, selfies and tropical vacation photos. But since I don't, here's another page full of photos taken in Oahu , Hawaii. This was another page where I kind of winged it on the color palette. I just picked up the Authentique Utopia Collection paper pad which is perfect for all those tropical photos I have. All the papers have a fun vintage Hawaii vibe which is really unique. I used a few of these prints a well as other left over paper scraps to make multiple photo mats. I edged one side of each mat with Fiskars Paper Edger Scissors for some added interest. I mounted the photos on paper from Crate Paper Maggie Holmes Vellum paper pad and embellished with items from My Mind's Eye My Story Mixed Bag, Flea Market Fancy Gold Camera Paperclips, Kimono Washi Tape (love the flamingos!) and Jolee's Boutique flip flops. I threw in some coral colored doilies too. This page was done for the March Scrap Our Stash tic tac toe challenge. While the challenge was St. Patrick's inspired and my final page was definitely not, I was still able to use it as a source of inspiration. I chose "mini alphas," "gold" and "washi tape." The gray and pink alpha stickers are Hazel & Ruby's Gone Typo Bitter Banner Alpha stickers. This page's sketch came from Stuck?! Sketches March challenge. I downplayed the circular element and focused on the square shapes. I really liked what Kelly did with the sketch and was inspired to do something similar. I'm about to go on vacation in a week and I still have lots of pictures to scrap from last year's trip to Hawaii! I'm sure I'm not the only one who faces the problem of having so many pictures piling up, but not enough time in the day to scrapbook them all! First world problems I guess. I started with variegated scalloped paper from The Paper Studio's Bea-Hue-Tiful stack. I love this collection, but don't use it often since the colors are so intensely vibrant and don't always fit my color schemes. I didn't have a pre set color palette for this page like I so often do so my paper choices were a little more flexible. Papers from DCWV's Royal Garden stack and Craft Smith's Summer Dream stack were layered over the top in a collage. This page was done for Scrap Our Stash's February challenge. They had the fun idea to use the word CUPID and participants must use elements on the page starting with each letter of the word. Perfect for February, right? It took some digging in my collection of scrap stuff to find all the elements, but I managed to come up with a list that is pretty unique. This same challenge also had an accompanying sketch. The triangle print paper I used made cutting a larger triangle super easy, plus it was full of tropical imagery and summery colors. Instead of doodling or stitching the circle on the right, I used various, colorful brads. Stickers, buttons, and mini travel tags by EKSuccess made up the rest of the embellishments. That's it for this time. Thanks so much for stopping by! Does anyone else get super exited when new true crime shows are added to Netflix or Hulu? Forensic Files is sort of my favorite thing right now! But back to scrapbooking. This page once again features one of my goofy cats.In the photos, she's actually in my bookcase among many of my paper pads I use for scrapbooking. I started with pale yellow houndstooth paper from Paper Studio's Affinity Stack. I used acrylic paint in primary colors and dry brushed a pattern around where my photos would be. The February challenge at Lasting Memories prompted using hearts or arrows on a layout. I used both. I used blue and red arrow print paper from Craft Smith's Summer Dream stack. I seriously love this collection of papers and its bohemian summer vibe. I also used arrows from the Our Adventure sticker sheet by Me & My Big Ideas. 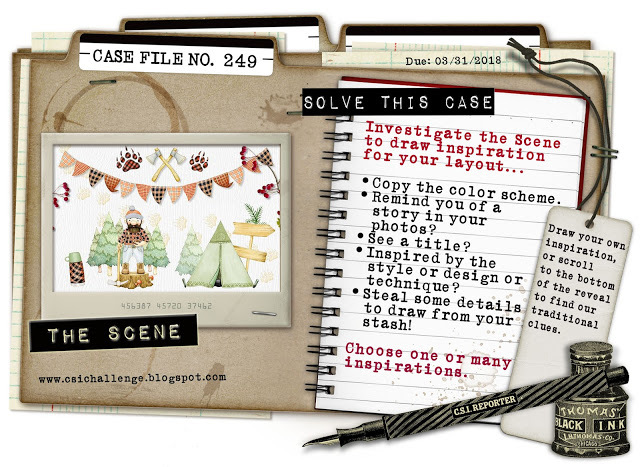 Both the layout and the color palette are taken from Color, Story, Inspiration's February challenge. The fun, primary colors really appealed to me and the simple layout allowed for flexible interpretation. Above all, its prompt to use monsters finally allowed me to use some stickers by Paper Studio that I couldn't resist buying, but had never had an occasion to use. Photos taken with iphone 5. That's all for now! Happy scrapping! Every vacation we go on, my husband and I take dozens of photos. Being the scrap addict that I am, I always have to scrapbook the majority of them. I still have dozens of Hawaii, Saint Jon, and Big Sur photos all waiting for pages. A prompt from 123 Challenge seemed perfect for these photos. The word "proud" had to be used somewhere on the the page and the dramatic Big Sur landscape definitely seemed to fit that description. I made "Proud" a bold title using Making Memories Puffy Alpha Stickers. The "California" Sticker is from La Petites California collection. I sprinkled sparkly blue star brads around and used Jolee's Boutique Gold Stars stickers. Various shades of blue are integrated into the color palette of the page. Conveniently enough, Scrapbook Fantasies' current challenge was also to use stars in the layout. While they show a 6 pointed star, I stuck with a more traditional 5 point star. I had great fun with Stuck?! Sketches January layout. I turned it 90 degrees to better suit my photos and used an assortment of smaller embellishments instead of one big star in the corner. Everything from buttons to a tiny safety pin found its way onto this page. A wooden token by Maya Road really captured the sense of travel and adventure. Assorted stickers from Mambi, Studio 112, Simple Stories and Paper House. Can I just say that the 3D Camera stickers are the squishiest EVER! I couldn't stop poking them. They are just so fun! The sketch's color palette was inspired by another of Design Seeds' wonderful images. Not only does it have multiple shades of blue in it to fulfill the 123 challenge and compliment the ocean hues in my photos, but the tans, reds and purples add variety. That's all for now scrappers. I'll see you next time! It's Winter in So Cal and all we've had for weeks is rain, rain rain! While the storms are welcome, especially since the state has been a drought for years, I miss the the sunshine and beach days that are depicted in these Hawaiian vacation photos. Depending on the time of year, turtle can be fund all over Oahu's beaches. Once on the brink of extinction, the green sea turtle has made a fantastic comeback after becoming a protected species. To even touch one is against the law! They come up on the beach to rest and sun themselves and don't seem to be bothered at all by people. This one was content to sleep while I read a book next to him and gazed at the sea. I used a blue background paper that had a subtle pattern and used old scraps that matched the color palette for the strips behind the photos. Each piece was edged with Mod Podge and then topped with Recollections Fairy Dust glitter in Frost. 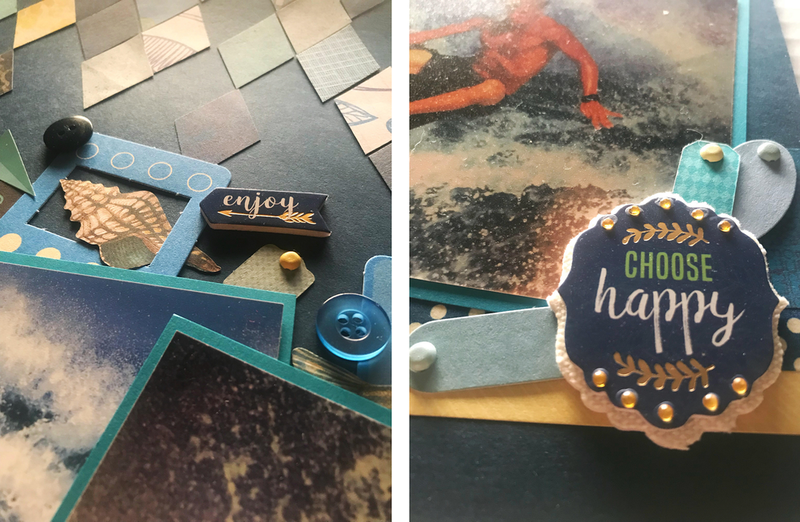 Embellishments used include Paper Studio's 3D stickers in Hawaii, Jolee's Boutique Beach Leisure stickers, and K & Company Travel die cut card stock. This color story by Design Seeds provided the perfect palette for this page. I loved the contrast of dusty pinks with cool blues and it went well with the photo's hues of sand, skin, sea and sky. The sketch used was taken from My Creative Sketches' December challenge. This two photo layout worked well with my selected photos and left lots of room for embellishments. I liked the pennant banners and modified the number to work with my title. This page as also made for the Scrap Our Stash January challenge. I love Tic-Tac-Toe challenges because they give you so much freedom in how t creatively integrate the challenge into your page. I chose to use squares "Twine," "Paperclip," and "The Color Blue." Hey scrappers! I bring you another page done for a holiday challenge that is decidedly not holiday themed. It's not that I don't like Christmas, it's just that I don't have any Christmas photos at my disposal. This photo was taken during our Summer vacation in Big Sur, (the same trip with the cows from my previous post.) We pulled off one of the many turnouts on the winding mountain road to take this photo. Behind us is actually the ocean, but it was covered with mist so thick that it looked like a bottomless abyss. I started with the blue postage themed paper from Prima Marketing's Botanical collection. I thought it worked well for a travel themed page. I paired it with red striped paper from The Paper Studio's Kellerkurtz & Company Square stack. It's simplicity balanced out the busy blue paper. This page's sketch came from Stuck?! Sketches' December challenge. I love the pennant banner and the opportunity to add so many little details. The color palette is from Color, Story, Inspiration's 220th case file. I liked the juxtaposition of the muted red with pale pastels. I had so much fun making this page! It's different from a lot of my other layouts because I don't do a lot of small paper piecing or big geometric cutouts, but this page ended up with both. The houses along the bottom were inspired by ARTastic's December challenge. I used the picture's color palette throughout the entire page and used paper scraps to make little houses reminiscent of the original illustration. A Sharpie pen was used for all the little details. The sketch for this page was taken from Stuck?! Sketches' December challenge. I used paper from My Mind's Eye Bramble Rose stack for the background mat and the giant star cutout. The titles was made with American Crafts Chipboard Letters in Petal. Additional embellishments include Sonia J Kawaii Cat Stickers and Momenta Word Play stickers. Good news friends! I finally figured out how on turn on comments. Is it obvous I'm a novice blogger? Now you can drop me a line if you so choose. I look forward to hearing from my fellow scrappers! While others are scrapping pictures of their loved ones opening presents and other holiday events, my page this week features...cows. Why not? These photos were taken in Big Sur during our Summer vacation. The background is hazy and smokey because much of the local forest was burning in one of the year's biggest wildfires! We weren't in any danger and neither were the cows, but many of the state parks were closed, forcing us to find other things to do...like take pictures of cows. I started with a subtle green textured paper from K & Company's Color Basics Imbue pad. A black and white damask print with a red mat made for great contrast. Embellishments like buttons, mini star brads and black adhesive dots tied the page together. The layout and color palette were both inspired by Color, Story, Inspiration's 219th case file. It's definitely a Christmasy collection of colors but I put a spin on it by not featuring any sort of holiday theme at all. I turned the sketch 90 degrees to better fit my photos.